(Phys.org)—A team of physicists working at the University of Glasgow has found a way to slow the speed of light that does not involve running it through a medium such as glass or water. Instead, as they explain in their paper published in the journal Science, they caused a change in the speed by first running it through a mask, which changed its shape. Everyone knows that the speed of light in a vacuum is constant, but now it appears that there is a way to indirectly alter its speed—by running it through a special mask. Doing so apparently causes a change to the shape of the photon, making it move through a vacuum slower than an unaltered photon. 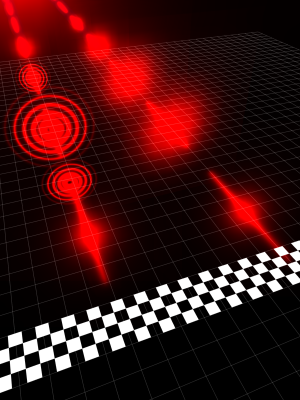 The researchers built what they called a racetrack—setting up a dual course for firing photons and detecting when they struck a detector a meter away. The first group of photons was fired in the normal way, while the second group was fired through a filter to shape it into either a Gaussian or Bessel beam. The photons from both groups were launched at the same time but the unshaped photons beat the shape-altered photons to the finish line by approximately 0.001 percent. There were two reasons for that. The first was that moving through the filter slowed the photons, much as would happen were they to pass through other mediums such as water or glass. The second reason was more complex, because it demonstrated that the speed of the photons was slower than normal after passing through the filter—light is supposed to speed back up to its normal constant after passing through a medium. The experiment showed that light can be caused to travel slower than c, by changing its shape. The researchers explain this result by noting that they were using group velocity to measure the light's speed—a measurement of the group's envelope speed. The mask, they explain, caused some of the photons in the group to move at a slight angle to the other's causing a slowdown for the group as a whole. Thus, their results are not going to upend one of the basic tenets of modern physics, it is more likely that future researchers will have to make sure lab or astronomical observations are not being impacted by shape changes that occur naturally. That the speed of light in free space is constant is a cornerstone of modern physics. However, light beams have finite transverse size, which leads to a modification of their wavevectors resulting in a change to their phase and group velocities. We study the group velocity of single photons by measuring a change in their arrival time that results from changing the beam's transverse spatial structure. Using time-correlated photon pairs we show a reduction of the group velocity of photons in both a Bessel beam and photons in a focused Gaussian beam. In both cases, the delay is several micrometers over a propagation distance of the order of 1 m. Our work highlights that, even in free space, the invariance of the speed of light only applies to plane waves. Read the University of Glasgow press release. isn't this still running light through a medium to change its shape slows the photon? I mean its still a medium? like gravity as a medium ? i still don't understand the concept of group velocity, but i do recall seeing this measurement as being the KEY to explaining a similar research experiment a few years back that claimed to speed up light beyond the speed constant C.
many people were claiming it defied funamental laws of physics. however, it is apparent that the idea of measuring 'group velocity' of photons' simply isn't the same as the underlying notion of what most people understand as the 'nongroup' or 'conventional' velocity of photons. wiki oversimplies the group velocity concept for the novice ( myself) by explaining that it is a distribution of angular wave frequencies (the angular frequency) divided by a distribution of wave amplitudes (the angular wave number) . so clearly----it is a SUM of photons and not a single quantized photon, which means you are not altering the funamental speed C of a quantum packet. you are altering the apparent speed of of quantum packets measured in a group. I knew it was possible, because there was something strange with quasars, where light in the center traveled faster. you two are referring to a very badly written series of articles on wave velocities that happened a few years ago. What happened was a wave of light -- think tidal wave -- hit a gas cloud and light that hit the center of the cloud went through the cloud faster than light that only hit the edges. And the people that wrote on that subject -- sucked -- cause it was just light going through a medium ... but the point was that the light that went through the most dense region escaped faster. and there was talk of wave fronts and it was all very confusing to read. and gravity is closer to a field not a medium--- like the field in which protons have a halflife longer than the universe type field. Or the field in which the higgs boson gives mass to other particles... like the field in which electrons are stable ... namely this universe. One way to think about group velocity, is the technical term for the "beat" of a set of waves of different frequency. Of course waves interfere, either constructively or destructively, determined by a point-by-point addition of each wave's contribution (ie. sum). You can pick the set so that the peak of their sum moves either faster or slower than each individual wave. Take a look at Wikipedia Beat (acoustics) they have a animation where the group's peak is faster than the individual waves. I'm not entirely comfortable with this explanation for the speed difference. First, the difference is very small. I'd enjoy an assurance that the result did not fall within the measurement error of their apparatus. Second, the researchers have not supplied a quantitative assessment of how much of the speed difference is due to the mask, and how much is due to the presumed altered shape of the bundle of photons after passing the mask. Third, they did not vary the experimental distance between emitter and target. This might be significant: by comparing times elapsed for varying target distances, it should be possible to tease out the exact speed of the photons after they exit from the mask. Failing to vary the distance traveled, and using that to obtain the exact (within measurement error) speed of the photons after they exit the mask, leaves the entire experiment and explanation vulnerable to an accusation of unnecessary sloppiness. Ok,this is probably a really dumb comment,but would light at just the edge of a black hole slow down,then reverse? Maybe a tachyon is a photon shaped like a bullet. The group velocity is dependent on the overall shape of a multitude of superposed photons (or at least two). Think of it like two sound waves with different frequencies. When you superpose those you get a third, apparent, waveform. If you pick two frequencies very close to one another then that apparent (!) waveform will seem to move forward with respect to the individual frequencies. But this is only an apparent effect and doesn't mean that the individual sound waves (or in this case photons) travel faster than they do.on their own. (or that this waveform could get anywhere faster than the first photon sent in the batch). Of course you can pick an offset that will make the apparent (!) waveform move slower, also. And that is what they did here. Check out wikipedia on group velocity for some good illustrations. This isn't a miracle, but 'just' neat engineering. If I'm reading it correctly (and I'm far from certain that's the case) the photon is determined to move more slowly *after* it has passed through the grid. I'm sure that will be corrected quickly if I have that wrong. And since neutrinos came up again, and even though this is a different lab, I still have to wonder: are they certain they don't have a loose fiber optic connection in there somewhere? f I'm reading it correctly (and I'm far from certain that's the case) the photon is determined to move more slowly *after* it has passed through the grid. I'm sure that will be corrected quickly if I have that wrong. The photons move at the speed of light. Their group velocity does not. It's best explained in the last paragraph of the article. Photons aren't slowed. A light pulse (made of many photons) is. I'm still lost on this. So if the photons move at C, how can a group move slower than C? Is it that a pulse should have been say 1 second long, but it shows up effectively being, say 1.5 seconds long, but the photons are still travelling at C, so effectively the pulse is just stretched? What does that mean??? Bigger gap between photons??? Me no comprende!! So if the photons move at C, how can a group move slower than C? So now imagine what happens when you take two photons and shoot them at a taget. Not straight but so that they are at a slight angle (convergin on one point. If you do it right (right phase to one another and with a slightly different frequency) you can make it seem that the ENVALOPE is going slower than the speed of light. It isn't strange that propagation speed of the photon which isn't a plane wave like neutrino vibration is smaller than speed of light.